Do you have an opinion on unpasteurized milk? My son's 1 year well-visit isn't until a month from now and we will be making the switch from Alimentum to Milk in about a week when he turns 1 (we have tested cheese and other dairy and he has not reacted). I have been reading that the enzymes that allow easy digestion of milk are eliminated in the pasteurization process and I like the idea of organic, grass-fed milk but if there are serious side effects I will continue my hunt for a quality pasteurized milk. 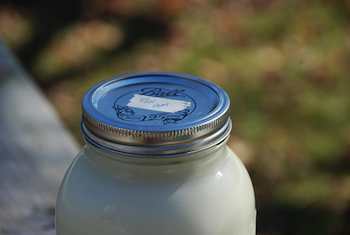 The Raw Milk debate is an interesting one with strong advocates on both sides. “Raw” milk is straight from the cow. Commercial milk today is pasteurized or heat treated to reduce bacterial pathogens. Pasteurization does not sterilize the milk it only reduces the bacterial load. Pasteurization was largely adopted in the United States about a century ago. At this time, people were leaving their rural roots and moving to cities. As people moved further from cow’s, milk had to be transported. The increased storage time and lack of adequate refrigeration led to an increase milk related disease. Pasteurization solved this problems and was adopted often by law in the early 20th century. 3.) That infections related to raw milk are rare. 1.) Reduces the incidence of allergies and asthma. - There are several studies that seem to indicate that raw milk may reduce the development of allergies and asthma. The best study to date is the PARSIFAL study from 2007. This is a multi-center, European, retrospective study of more that 15,000 school children. It concluded that in their study “Farm Milk” seemed to lower an individual’s the risk of allergies and asthma. While this is exciting, it is an early study. The authors conclude their paper by stating,” At this stage, consumption of raw farm milk cannot be recommended as a preventive measure.” The anti-raw milk voices are quick to point out that “Farm Milk” is not equal to “Raw Milk”. Some “Farm Milk” has been boiled. The study looks at the development of allergies in children who grew up on farms compared to people who did not. I doubt many allergic/asthmatic families chose to raise their children on farms and am not surprised that farm children had a lower incidence of allergic conditions. 2.) Help with lactose intolerance - Raw milk enthusiasts often report individual cases where raw milk is better tolerated than commercial pasteurized milk. Several websites report that this improved absorption is secondary to probiotics found only in raw milk. Reportedly these probiotics produce the enzyme lactase that aids in digestion. Several of the raw milk skeptics deny any improved digestibility and report no evidence of probiotic created lactase enzyme. A 2010 Stanford University study funded by pro-raw milk enthusiasts investigated and confirmed these doubts. The study called “Effect of Raw Milk on Lactose Intolerance Symptoms A randomized controlled trial” looked at raw milk tolerance vs pasteurize milk tolerance in lactose intolerant subjects. The study concluded that raw milk did not impart a benefit for lactose intolerant individuals over pasteurized milk. Pro-raw milk voices point out that milk related infections are rare. Often pointing out that other foods especially egg and fresh produce are responsible for more infections each year. Honestly, some of these infections can be devastating. While I acknowledge that food is perfectly safe, we should do all we can to encourage maximal food safety. Cook your eggs, wash your produce, wash your hands and buy pasteurized milk. In conclusion, the allergy related benefits and improved digestibility of raw milk is exciting, but unsupported. Hopefully, continued research in this area will clarify these issues. Currently, the very real risk of infection outweigh the potential benefits of raw milk. Waser, M., K. B. Michels, C. Bieli, H. Floistrup, G. Pershagen, E. v. Mutius, M. Ege, J. Riedler, D. Schram-Bijkerk, B. Brunekreef, M. v. Hage, R. Lauener, and C. Braun-Fahrlaender. 2007. Inverse association of farm milk consumption with asthma and allergy in rural and suburban populations across Europe. Clinical and Experimental Allergy. 37:661-670.